Technical traders love charts. Stock price charts tell us everything we need to know. And the technical analysis of stock trends can bring us success. If that is the case, why aren’t more traders profitable? One key reason is the myriad of price and volume data derivatives. There are indicators, oscillators, histograms and the list goes on. It’s as confusing as having a grocery store thrown at you when all you want is to boil an egg. Advanced analysis and indicators have a time and a place. They serve as an excellent opportunity filter and convenience. But many traders falter by failing to form a sound basis of some basic chart patterns. So here are 3 essential patterns for success in your technical analysis of stock charts. These are some of the most basic yet important patterns of all. Learn them, and you will have the power to understand charts at a new level. Support, resistance and trendline are terms that get thrown around a lot. These terms seem simple and this fuels their frequent rate of misuse. Nobody would care to admit that they never took the time to understand them. I want you to have the keys to understand them well, so that you can wade through the misinformation. Example: Support levels on a daily stock chart. Support is any price level where the price has fallen to and then recovered to higher levels. The lowest levels to which the price fell is where it found support, which is what made the price go up. This type of analysis is useful information to a trader. The basic premise is that past support levels repeat more often than not. 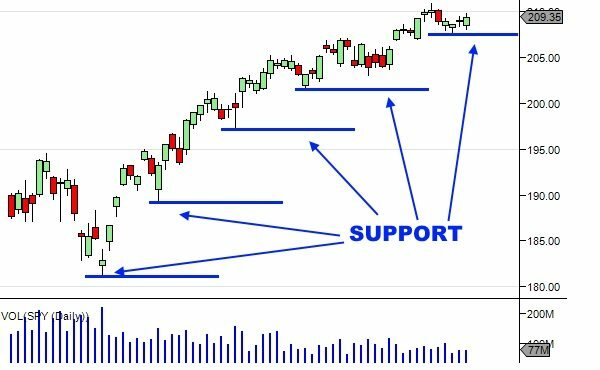 If support existed at a particular price level from which it then rose, it is likely to do so again in the future. A stock is a good buying candidate if it has made a series of higher support levels. The best technique is to buy a stock when it is approaching a support level. You do so with the expectation that prices will rise. What happens then is that it will either rise as expected or it will fall. If it rises, you will profit. If it falls, you will be stopped out at a loss. This is all about probability. Probability works over time and repeated trades. Since there is a higher probability of price rising, if you place enough trades you will come out at a net profit over time. 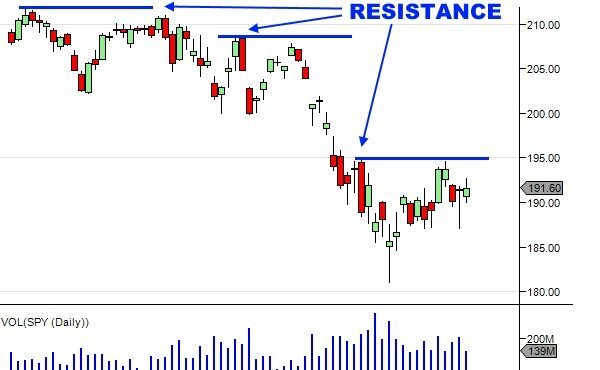 Example: Resistance levels on a daily stock chart. Resistance on a price chart is any price level where the price has risen to and then fallen to lower levels. The highest levels to which the price rose is where it found resistance, which is what made the price go down. Like upside-down support, the premise of resistance is that pasts resistance levels repeat. If price encounters resistance at a particular price level in the past, it will likely do so again in the future. Opportunities to sell a long positions exist when price approaches a resistance level. Here, there is the expectation that upward movement of price will stall. The same reasoning applies to short traders looking to start a position. Example: Uptrend on a daily stock chart. 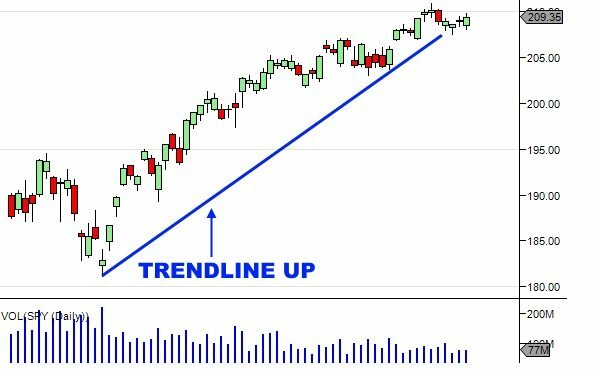 An uptrend line connects consecutive and increasing levels of support. It’s slope shows the speed at which price is increasing over time. 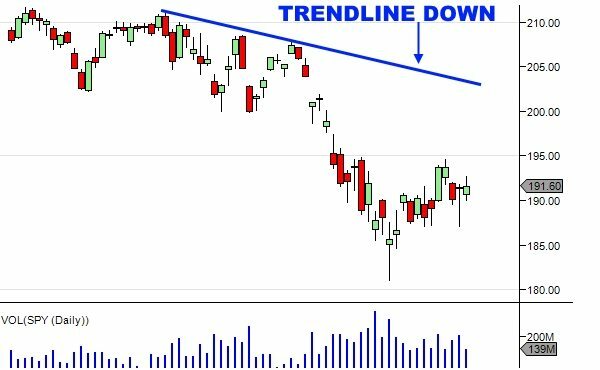 Example: Downtrend on a daily stock chart. Downtrend lines connect consecutive and decreasing levels of resistance. The slope of these lines indicates the speed at which price is decreasing over time. Steeper lines show higher momentum than more gradual ones with a lesser slope. Trendlines are an effective analysis tool that tell us the strength of a price movement. “The trend is your friend” is a common saying. This holds true for traders who want to trade without overcomplicating matters. So make sure you trade with the trend. It’s simple to identify, yet understanding and applying it is powerful. 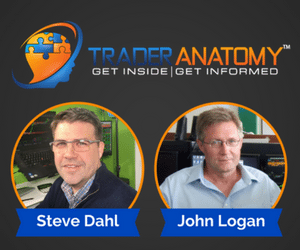 The range and range breakout trade is one of the most popular methods that day traders use. It’s also one of the most effective. A range forms when prices are bound by an upper and lower limit. The upper boundary forms when the price rises to a certain level and then falls. These observations must happen two or more times to be valid. The lower boundary forms when the price falls to a certain level and then rises again. Again, this must happen two or more times to form a valid lower boundary. Range traders use the boundaries as their guides and trade within them. They buy as close to the lower boundary as possible and sell as close to the upper boundary as possible. Example: Range on a daily stock chart. Range breakout traders use the boundaries as their breakout move guides. They buy as price breaks up from the upper boundary and sell as price breaks below the lower boundary. 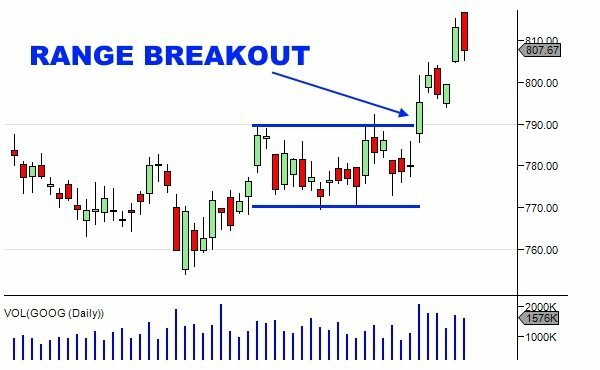 Example: Range breakout on a daily stock chart. Whichever method of range trading you use, it can be a simple yet effective strategy. 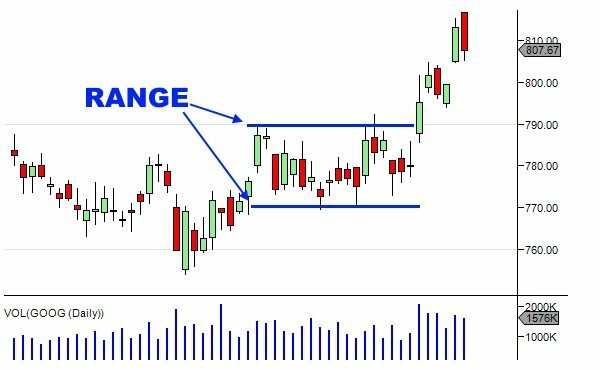 It’s a good idea to make sure you understand range trading and consider using it to improve your results. Technical analysis uses hundreds of indicators. With all the customizations available, the possible combinations and trading strategies are infinite. What matters most is for a trader is to recognize what underlies all those indicators. Under all the derivative calculations is the immutable data. This data consists of time, price and volume. The humble price chart is a powerful tool. It can uncover more about the markets than any other facts or calculations. A trader who uses technical analysis in the form of the price chart is analyzing what matters. The skill of technical analysis applies to all products that trade on open exchanges. It goes far beyond stocks. Traders use technical analysis on stock trends will be able to analyze futures and Forex as well. 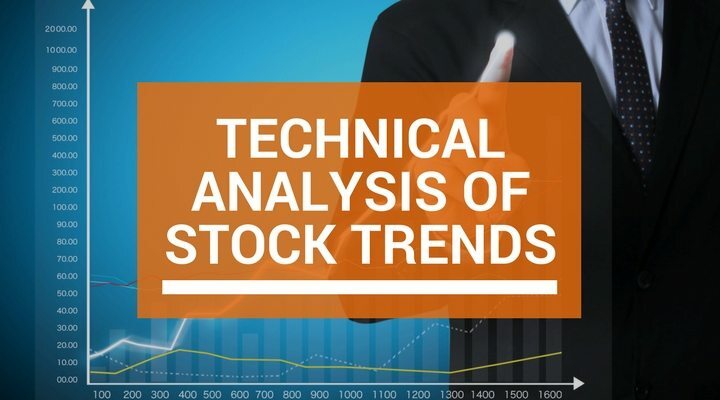 Understand these three patterns to improve your technical analysis of stock trends. Do you know someone who uses charts? They’ll enjoy the same information you now know. Share this post using the buttons below!